United to Love Youth Moral Courage Award nominees stand backstage at ROCK. L-R: Sophia Didawick, J'TA Freeman, and Caleb James. A special “first” occurred at ROCK Feb. 9. 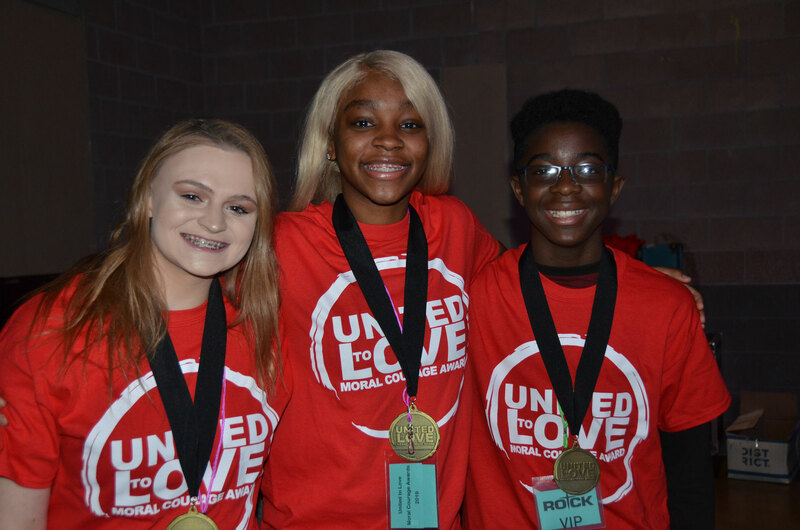 The first-ever United to Love Youth Moral Courage Award was presented to J’TA Freeman, a high school senior from Washington, D.C. She was one of three finalists for the award, which also included Sophia Didawick, a senior from Berkley Springs, W.Va., and Caleb James, 12, from Severn. (Read their stories, below). “Love of God is always linked with love of neighbor, a passion for justice and renewal in the life of the world,” said the Rev. Stacey Cole Wilson, Executive Minister of Justice and Service for the BWC. She presented the award on-stage at ROCK. “The Moral Courage Awards seek to identify, inspire, and encourage persons of various ages who are alleviating human suffering, boldly living their faith and then sharing their stories with the invitation for persons to consider that they have the power to change/influence." Freeman, who attends Ebenezer UMC in Washington, won the award thanks to her dedication to serving the youth of Washington, D.C. She was nominated for the award by her pastor, the Rev. Bresean Jenkins. Freeman’s uncle was killed when he was 18 years old, she said. “He was basically left to die,” she said. To this day, she added, no one knows who murdered him. But because his voice was silenced, Freeman is using her voice to speak up and speak out. Her efforts also include improving the quality of education in the city. Freeman trains youth on how to be an advocate for issues they care about because, she said, “everyone has a God-given voice.” All this work, she said, is God-inspired. Didawick’s nomination cited her work in a “Care Pack” ministry in Morgan County, W.Va. Didawick packs hygiene kits for students in and around there that include soap, body wash, deodorant, shampoo, conditioner, a toothbrush and toothpaste, floss and mouth wash.
Didawick started the ministry in her sophomore year after learning that some of her fellow students didn’t have essential hygiene products. Today, she packs about 350 kits every month, totaling 6,458 since the start. Sometimes, she confesses, she wonders if this work is making a difference. Didawick knows her ministry is helping others. God has also been telling her to keep her ministry going after she graduates in a few months. Her efforts have been supported by two grants from the BWC. The Young People’s Ministry area contributed $5,000 recently, and the Action and Advocacy Network awarded her $3,000. Caleb James is in the 7th grade, lives in Severn and attends Sharp Street Memorial UMC. After being selected to serve on the Student Leadership Council at his school, James came up with the idea of collecting donated socks for homeless shelters around the state. More than 2,000 pairs have been donated and given away so far. When James was in 5th grade, he was involved in a project where his topic was poverty and homelessness. The next year, when he was nominated for Student Leadership Council, he brought up the idea of helping people. “It was winter time,” he said, “so I said, ‘How about we donate some warm clothes, specifically, socks?’ So, we organized Socktober.” Donations come in from the church and from the school. Knowing that he’s helping others makes James feel good inside, knowing that he’s also making a difference in the world. The project, he said, continues with big goals. James knows that God is calling him to continue his sock ministry. Learn more about the United to Love Moral Courage Awards and these three phenomenal young people at https://www.bwcumc.org/moral-courage-awards/ . There are three short videos, each highlighting one of the nominees. In addition, you can nominate Young Adults and Adults for similar awards, which will be announced at the 2019 Baltimore-Washington Conference Session in late May. Applications are due April 1. Congratulations to all of the youth. A special congrats to my nephew Caleb James, keep up the good work guys. God is good !